and it’s in Princes Risborough in Buckinghamshire, just down the road from where I live. I’m more excited about this new freefrom shop opening than I am about Christmas this year. 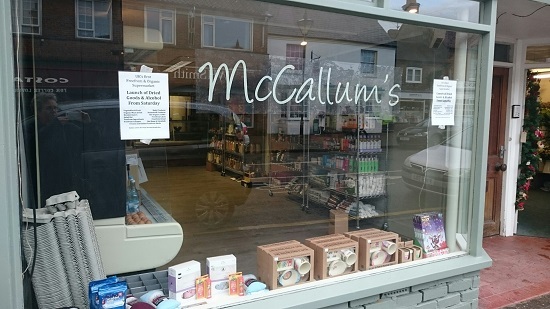 This is a very mini bloggette to let you all know that on Saturday 12th December, McCallums will be opening on Princes Risborough High Street. I have been reliably informed (thanks Suzie) that is is near the library, opposite WH Smiths. And hot off the press, this lovely photograph of the shop courtesy of Sally and a tip off from Nicola Next Door! Thank you all for letting me know this shop was opening. I met Alex this year so I did know he had ambitious plans for the shop and some pubs catering for paleo and freefrom diets but it had slipped my mind in the whirl or work and life. Alex is also running The Black Horse at Standlake – the first freefrom and organic pub in the country which is now open and the second – the Bell at Hardwick, just outside Aylesbury opened in November. More on these later. I think we’ll be enjoying a few pub meals out in the new year.